I don't usually mess around with plastic auto-focus cameras, but when I received this Minolta Dynax 3xi as a free bonus with another purchase, the disintegrating grip on an otherwise nice camera bothered me. So much so, that I decided to give it a face lift by peeling off the crackling cover of the grip and replacing it with a new cover of some sort. In the process bits of plastic found their way under the top cover somehow, so I set out to take off the top, as well. This turned out to be more work than I bargained for. On most 35mm SLRs (the ones I have worked on, anyway) the top cover can be removed without much fuss, as it is independent of the other parts of the camera. But even though I have removed all the screws that apparently held the camera top in place, it just wouldn't come off. 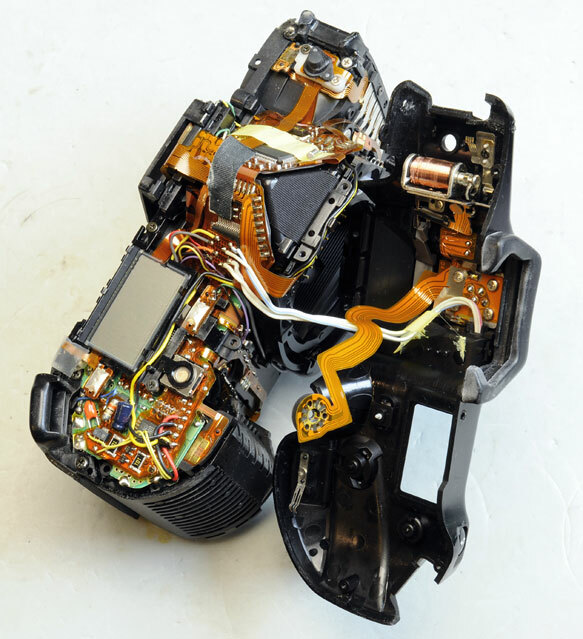 Not being one, who gives up easily, I set out to dismantle the camera front, as well. One thing followed another and before I knew it I was elbow deep into the bloody thing. Take off the bottom - six screws. (The screw near the serial number is longer.) The back door will also come out of its place. Pop up the flash and remove two screws behind the MINOLTA logo. 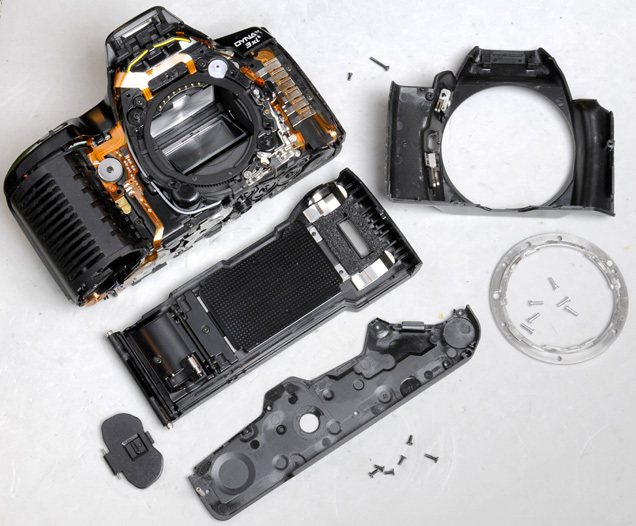 Remove the lens and take out the six screws that hold the lens mount. Remove the lens mount. Take out two screws from the back at the underside of the top, where the top edge of the back door meets the top. Take out a long screw from the top of the battery compartment inside. Remove one screw from the right side of the viewfinder eye piece. 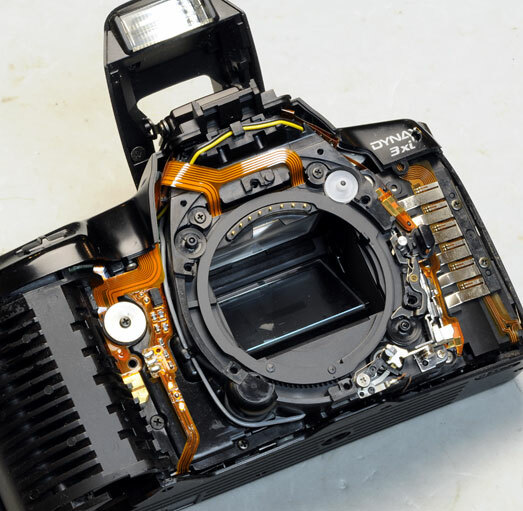 As you see, the camera top is still in place and it will not come off, unless you do the following. Find the screw half way between the top of the grip and the lens mount, which screws into the top plate from below. Remove that screw while being careful not to damage the printed circuitry. In the same area there is a silver disk with a screw in the middle of it. Undo that screw and free up the orange printed circuit which leads to the top of the penta-prism. And viola! - the top lifts off at last. It is amazing how much electronics went into a relatively basic (i.e. entry level) automatic camera like this. Looks complicated. I would not swap my Minolta SRT 101 for this monster.